Simply romantic, our award-winning One-hundred Roses Bubble Bath is infused with rosewater and rose hip oil. 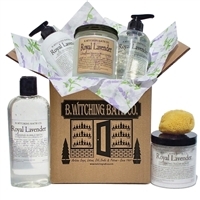 Share the gift of a relaxing and fragrant bath that conditions skin as you bathe. This gift set includes one bubble bath and one bath puff, delicately packaged in a cello gift bag with bow. Perfect for giving.